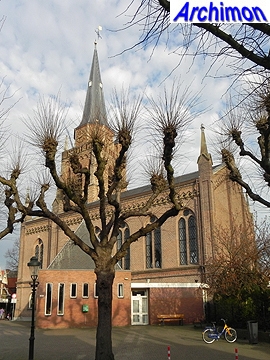 Voorschoten is an old village, and it already had a church of stone in 866, probably preceded by a wooden church. 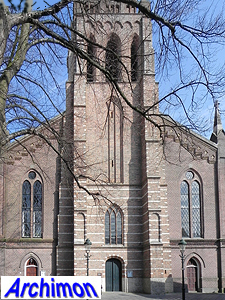 The current protestant church, or Dorpskerk ('village church') as it is called nowadays, was preceded by a late-Gothic cruciform pseudo-basilica, which was destroyed during the Siege of Leiden (1573-1574). 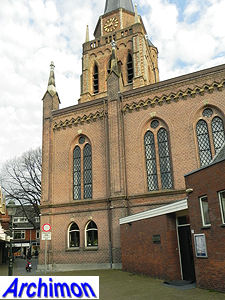 Its nave was rebuilt by 1583 to now serve as a protestant church. The ruins of the transept and the choir, parts of the church now deemed unnecessary, fell into decay and in 1742 were lowered to serve as the walls of a new cemetery. The tower, a late-Gothic structure built in ca. 1540, was probably not repaired until 1595. 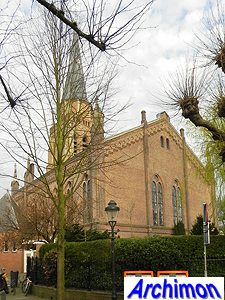 The church served until 1868, but was in a bad state. The Voorschoten population was generally poor, and for the bigger part catholic as well, but in 1866 a rich local lady, M.I.H. 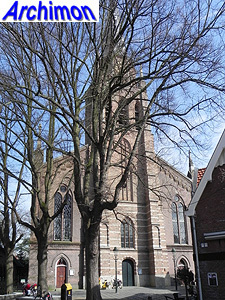 Kuijs, gave 16 thousand guilders for the replacement of the church. Perhaps it was no coincidence that at that moment the local catholics had just begun to replace their church by a bigger one and the protestants may have felt they could not stay behind, but soon there was a budget of 35 thousand guilders. 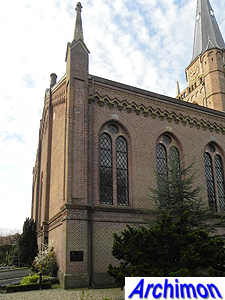 In January 1867 architects were invited to enter a competition for a design of a new church. It was to be big enough for 600-800 seated people and to provide undisturbed view at the pulpit. Also, it had to be attached to the old tower and the graves east of the church were to be left alone, limiting the available space. 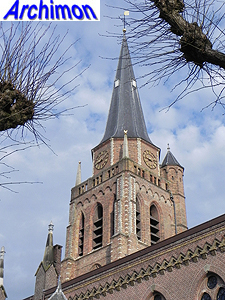 Architect A. Truiding won the competition with his design, named 'A-toi, Dieu ’t aidera', but as he had just emigrated to America he handed over the assignment to his former companion J.A. 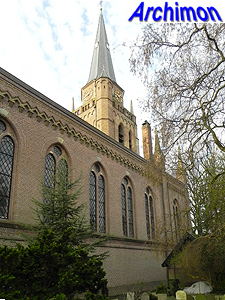 van der Kloes, who made several changes to the design. 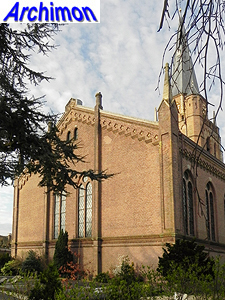 The new church was built in 1868 and is in a neo-Gothic style of a purely decorative nature, complete with redundant pinnacles. A bit like its catholic counterpart, actually. Its ground-plan is almost square. The tower, which until then had been free on three of its sides, was now enclosed except for its front side. 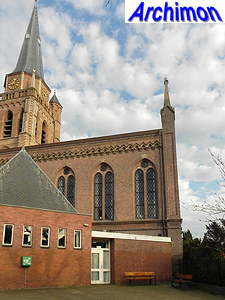 The spaces on both sides of the tower are not part of the nave and are closed with walls on the east side. This makes the actual church space rather short compared to its width. Although the interior was visibly divided in three 'aisles', no pillars were used. Instead the space was covered with a unique bar construction that spanned almost 40 metres. In 1961 it was hidden underneath a flat ceiling as part of a modernization that otherwise completely wrecked the interior. 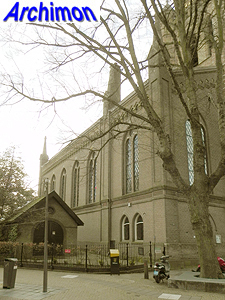 In 1963 an annex was added to the south side of the nave. 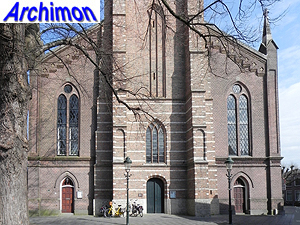 In 1997-2011 the church was restored and most of the modernization of the nave made undone. The tower owes much of its current looks to a restoration in 1955-1958, when several 19th-century changes were made undone; older pictures still show the front of the tower with a neo-Gothic portal with a circular window above it and a large pointed window instead of a niche above that. That restoration also resulted in the addition of an octagonal lantern on top and the replacement of the former spire by a slimmer one. In recent plans the current annex will be demolished and replaced by a new one.